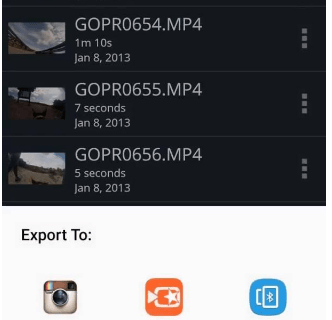 Accessing your stuff (movies, music, photos, videos & docs) on the go, on-demand, is the latest digital trend. 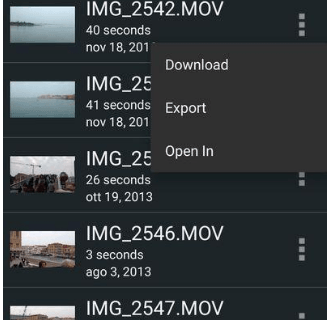 However, it is not always easy to access all your media stored across multiple devices. For example, when traveling it can be inconvenient to carry your laptop, hard drives and other storage devices with you. There is also the risk that you might lose a device, or one could get stolen. We have found a workaround solution, one which is handy enough to take along with you and provides safety in terms of any unplanned happenings. 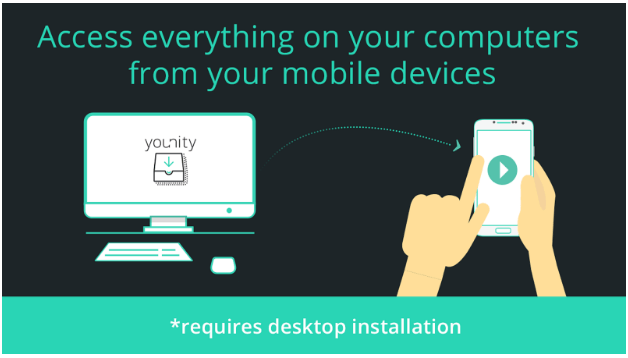 Younity is the standalone on-the-go solution to all your media and file access needs. Unlike other cloud storage applications, younity does not require uploading, syncing or configuration. 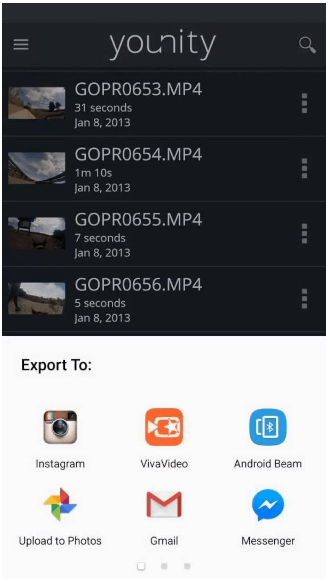 The younity app gives you access to all the media stored on your computers from your mobile devices including both Android and iOS, allowing you to “carry” everything around with you. 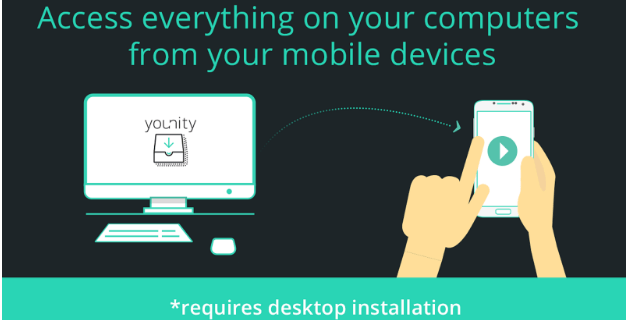 The concept is pretty simple, just install Younity on all your computers and download the app to your smartphones and tablets. The younity app lets you play movies & music stored on your computer from your phone, post your photographs to social networking sites like Instagram, Facebook, Tumblr, etc., share photos with friends through popular messaging apps like WhatsApp and Facebook Messenger, and even access, download and edit documents stored on your computer. Once downloaded, double click the installer package and follow the on-screen instructions. When Younity is successfully installed, you will see the Younity icon in the system tray, at the bottom of your screen i.e. called as Taskbar. 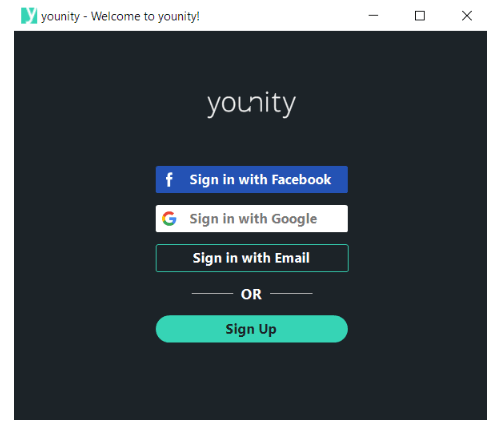 Once you have installed Younity on your computers and mobile devices, next comes account creation. 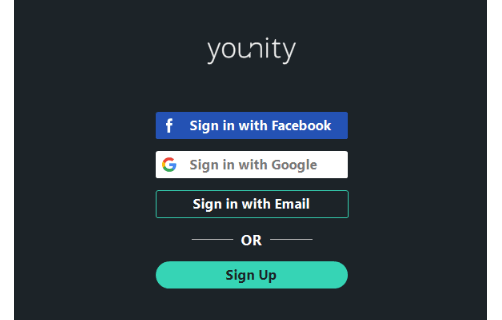 When you start Younity for the first time, it will give you the option to sign in with your Facebook, Google or email account. Make sure you are using the same method of login on all of your devices i.e. desktop as well as mobile. Upon installation Younity will scan your computers for all your stored media files, once indexing is complete you will receive a confirmation. The name Younity draws inspiration from the word “unite”, unifying all your devices and media stored on them into one easy user interface. 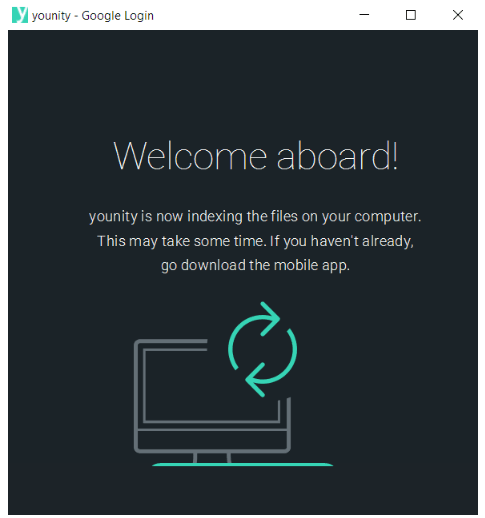 The younity app organizes your files in the same way as they appear on all of your computers giving you the ability to easily search and navigate through folders and sub-folders. 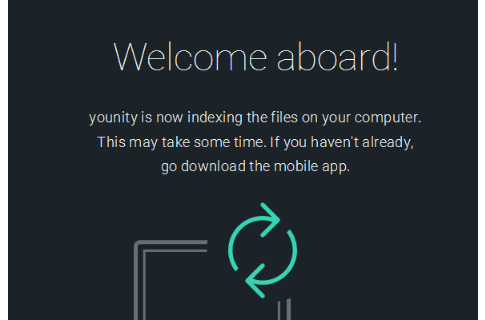 Younity is not only about giving you access to everything on your computers from your mobile devices, Younity’s search feature gives you the ability to find a specific file by typing the name of the file in the search bar. You will be impressed by the speed of search results. As soon as you start typing the first few letters of the filename, relevant search results will be listed, it simulates how you would search for a file on your computer. Younity is one step ahead of traditional cloud streaming applications. Other applications require both sender and recipient to use the same application in order to share files. Although younity does offer the option to share a file with other younity users, there are several other options. With younity you can download a photo stored on your computer directly to your phone or use the ‘Open In..’ feature to send a photo directly through WhatsApp, Snapchat, Facebook etc. without taking up memory or space on your phone. These are great options if you want to share photos privately, opposed to sharing publicly on social media platforms. With younity all your social networks are accessible in-app. 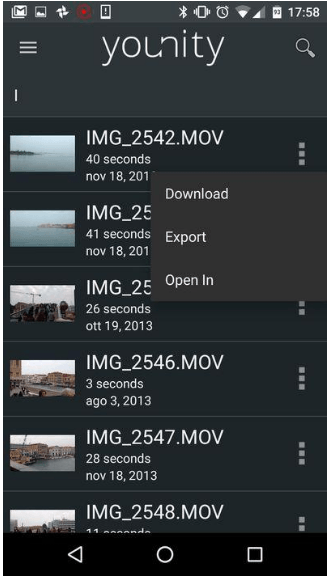 If you want to post any of your photos, including one from your Lightroom catalog or even a GoPro video, directly to social media all you need to do is locate your photo, click the icon in the lower right-hand corner and then select the desired app you want to export the photo directly to. In my experience, I have found Younity superior to all other cloud streaming services. 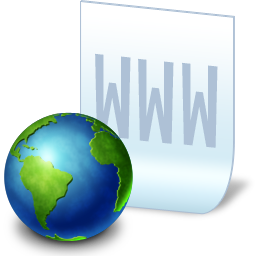 File browsing, file searching, music playing all services are fantastic but to be noted, if you are running on wifi network then no doubt all services will be running smooth. 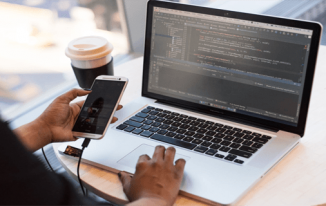 In the case of mobile data, overall connectivity and streaming depend on the speed of your service provider. Video streaming also gives you the capability of loading subtitles but unfortunately, in my case, I was able to load subtitles only once. Being superior doesn’t mean there are no opportunities for improvements. Services are good and can be made better with very few or minor improvements which are required for performance enhancement. I would definitely promote using Younity; you must give it a chance and explore the rest of things yourself. What a great app! I think I will have to update my post about apps for bloggers and business with this one! 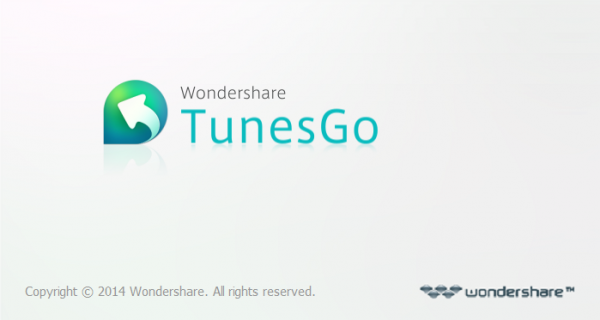 Thanks for telling about its various features, I am sure this will be a great help to the bloggers. I will share it with my fellow bloggers. 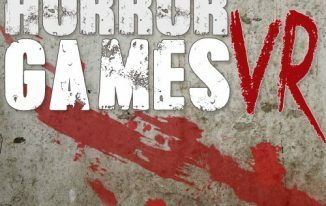 Happy to read the feedback of Lorraine and i noticed here post link in the CommentLuv, I am on my way to check that too! LOL Thanks. 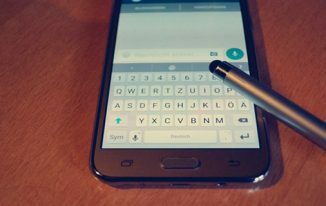 Philip Verghese Ariel recently posted…The Power of Blog comments! A great Strategy To Get More Traffic. Most of the time people fed up because they have to transfer their data from their laptop to their phones. This app seems to be quite helpful for such people. People like to go around and have their media with them to pass the time. Younity would let them have the fun. Ravi Chahar recently posted…25 Mesmerizing Tactics To Get More Comments On WordPress Blog. I heard about Younity app the first time. you shared ultimate tool. i will try it. thanks for sharing the awesome article. That’s Amazing application, Atish You have shared on this blog new topis, So, I will try this application. Thanks for shared. Nice review of the younity app. This is the ultimate solution for all those people who work with multiple devices of juggle between office and home pcs/mobiles. Thanks for introducing this to us. A definitely must-try app for me. Thanks and have a good day ahead! Thanks for sharing about this amazing app. I am definitely going to try it. Have a good a week ahead. That is Amazing application, Atish You have shared on this site new topis, So, I will attempt this application. Much obliged for shared.